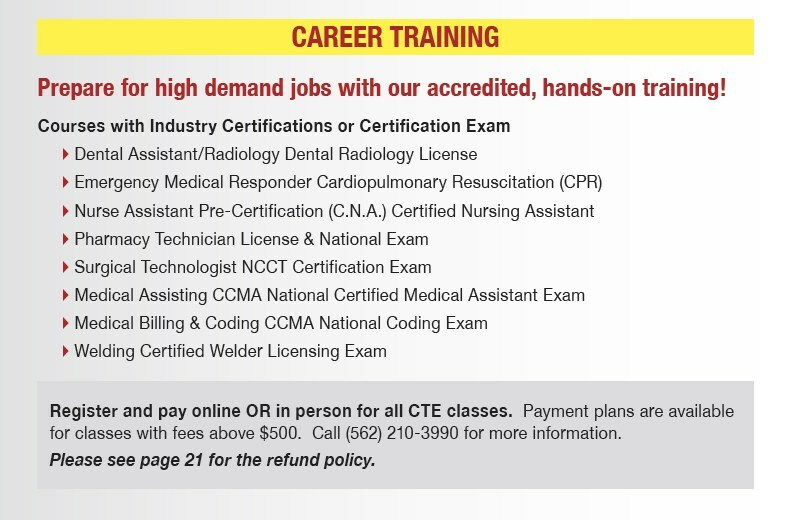 For a list of Career Training classes, see brochure. All courses prepare you for Industry Certifications or Certification Exams. For a list of Office Career Pathways and courses available, see brochure. Students enroll at the beginning of the semester or session, begin class on the same date, meet the same day and time each week, and work on similar skills under a teacher-directed instructional setting. These classes are offered morning, afternoons, and evenings and are either 9-weeks or 18-weeks in length, depending on the course. Students enroll and begin class at any time of the year and work at their own pace under the direction of a teacher and paraprofessional. For class schedules and fees, see Fall/Spring 2018 Brochure.